Charleston’s newest outdoor event venue. The Dogwood Downs property has been privately owned as our family’s secluded retreat for more than 40 years. Four generations have enjoyed the beautiful landscape, nestled among 25 acres, which sits just 20 minutes south of Charleston, South Carolina, and now we want to share this natural sanctuary with you. 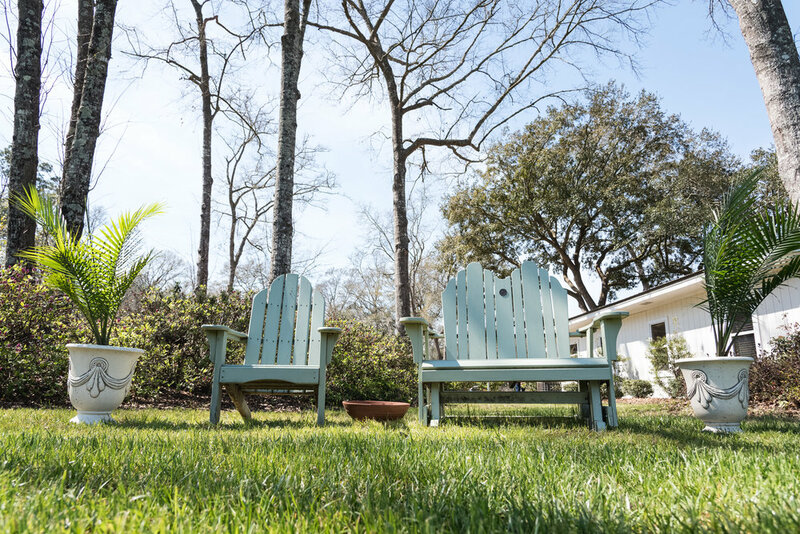 Dogwood Downs is a unique, affordable destination close to downtown Charleston as well as Edisto Island, Johns Island, Kiawah Island, and Seabrook Island. With more than 43,000 square feet of outdoor space available for events, we can accommodate any event from an intimate gathering to a large party with up to 500 guests. Your wedding or private event will be surrounded by serene woodlands, large oaks, and a pond with a water fountain, which can be enjoyed in the blooms of spring and summer or in the crispness of a Lowcountry winter. · Outdoor photography sessions for engagements, wedding parties, fashion shoots, etc. We invite you to visit our little slice of heaven on earth and envision the perfect event at Dogwood Downs. If you are interested in scheduling a tour of Dogwood Downs, use the form on the Contact page or contact us via phone or email, and we’ll be in touch very soon! For more than 40 years, four generations of our family have enjoyed this beautiful landscape as a secluded retreat. We realized that this special property would be a wonderful place to allow others to come and take advantage of its natural beauty. Nestled among 25 acres, and formerly a plant nursery run by our family, we have worked hard to prepare a unique venue for outdoor events of any kind. Each season brings its own kind of unique environment that becomes the perfect backdrop for gathering people together. This unique property has a special place in our hearts, and we are so happy to be able to share it with you. There was the day the backhoe accidentally went into the pond! All of this now is beautifully landscaped, and on the cottage, the enclosed screen porch has been opened up. A view of the overgrown pond before it was cleared and the fountain installed! This was a huge accomplishment for these two women! In 1956, David H. Hartzog started a plant nursery in West Ashley and in 1985, he moved the location of David’s Nursery to Ravenel to what is now Dogwood Downs. The business flourished, and the cottage on the property was used as a second home for the family to escape their busy lives and enjoy the beautiful landscape. In 2008, David passed away and his daughters Holly and Kyndra and their families continued to visit the property. In 2015, the two daughters attended an outdoor wedding, and the seed was planted for their family property to have a greater purpose. Holly and Kyndra began transforming the land with the vision of Dogwood Downs as their goal. The two did most of the work themselves, and as you can see from the “before” photos here, what they accomplished is nothing short of amazing. A plant nursery was transformed into a lush and beautiful landscape. Officially opened in 2018, Dogwood Downs is the newest outdoor event venue in the Lowcountry, and is a testimony to a hardworking Southern family with a dream of sharing this piece of heaven on earth with others. This was what the venue looked like as a plant nursery! First all of the plants had to be moved and then the ground cover fabric had to be removed along with the hundreds of pins holding it down. They struck water! A sprinkler system has to be completed before it can be tested and that took about 4 to 6 months. This was a happy day!